You have 64 bit Windows 7 on a 64 bit computer with at least 4 GB of RAM (preferably more) and at least 60 GB of free disk space. Note that it appears that Database 12c is really going to need quite a bit of memory, so 6 GB or more for the virtual machine would be ideal. Database 11g R2 worked with 4 GB. You have a network connection. You have an Oracle.com user account. If you don’t, just go to Oracle.com and click on the register link and follow the registration process. You have a CPU that supports VTx/AMD-v hardware acceleration and you have enabled hardware acceleration in your system bios. If you have not done this yet, google ‘Enabling VTx/AMD-v on a <Your machine type, for example Dell> <Your machine model number> to learn how to boot into your bios, enable the feature and then save and reboot your machine. Here’s my system description. 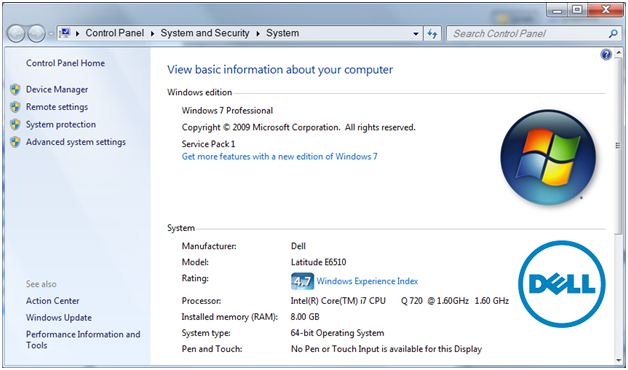 While it’s a few years old, it’s not a bad system with 8GB of RAM and a 4 core processor with 8 threads. This entry was posted on Tuesday, January 21st, 2014 at 8:59 pm	and tagged with Database Install, Oracle, Oracle Linux and posted in Code, Linux. You can follow any responses to this entry through the RSS 2.0 feed.